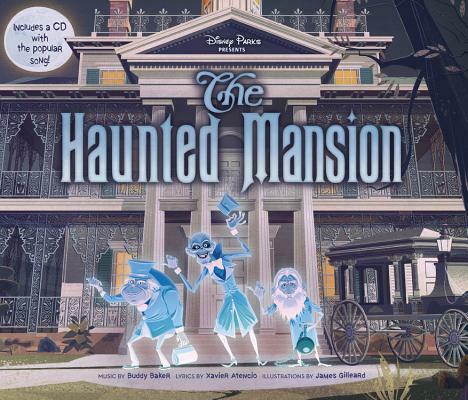 The Haunted Mansion: Purchase Includes a CD with Song! The song "Grim Grinning Ghosts," composed in the late 1960s, continues to reside in the dark corridors and spooky cemetery of the Haunted Mansion. Millions of guests leave the mansion with not only a hitchhiking ghost but also this jaunty tune catching a ride all the way home. In this hardcover jacketed picture book, James Gilleard's shadowy, textured illustrations accompany the lyrics of the classic song, and together they take readers on a guided tour deeper and deeper into the mansion, from the portrait gallery and seance room to the grand hall, the creepy attic, and more. This charming picture book includes a CD featuring the song "Grim Grinning Ghosts." Buddy Baker and Xavier "X" Atencio, both Disney Legends, created "Grim Grinning Ghosts" together, with Atencio writing the lyrics and Baker composing the melody. Baker has composed more than two hundred scores for Disney movies, such as The Fox and the Hound; television shows, such as The Mickey Mouse Club; and theme park attractions, such as The Many Adventures of Winnie the Pooh. Atencio started his career with Disney as an animator, working on such classics as Fantasia and Mary Poppins. He later became an Imagineer and scriptwriter and helped create Disney Parks attractions, including Pirates of the Caribbean in Disneyland and Space Mountain in the Magic Kingdom at Walt Disney World. James Gilleard was raised in a small village called Garthorpe in the North of England before moving to London to study illustration and animation, which he now does for a living. His love of vintage animation has influenced his retro style. He enjoys old cartoons, pulp comics, birds, dinosaurs, and everything 1960s and 70s.